A bold composition and a steampunk sensibility are highlights of Patrick Jones’ spectacular, insanely detailed creation scene. Born in Belfast, trained in London and now working out of Brisbane, Australia, Patrick Jones, influenced by Frank Frazetta and Richard Corben, has earned the admiration of fans and peers the likes of Julie Bell and Boris Vallejo. Jones shares his immense talent for science fiction, fantasy and horror art through books and videos detailing his techniques. 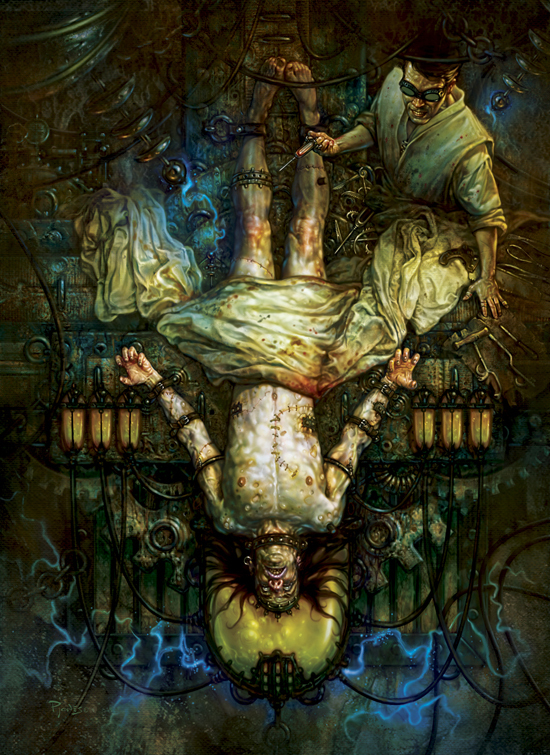 The Frankenstein painting is offered from the artist’s webshop as a limited edition Giclee print. Patrick Jones’ website and blog. An interview and step-by-step demonstration illustrating Richard Matheson’s I Am Legend, on bare•bones.